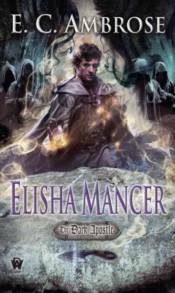 Elisha Mancer is the fourth novel in the Dark Apostle historical fantasy series set in an alternate 14th-century Europe. Elisha was once a skilled barber-surgeon, but healing is no longer his finest art. After discovering his exceptional potential for a singularly deadly magic, Elisha has slain a king, stopped a war, and even had the regency thrust upon his own commoner�s head until he could rescue the true heir, Thomas. With Thomas back on the throne of England, Elisha must now work on his king�s behalf to fight an even greater threat than civil war: the specter of the necromancers, a shadowy cabal that has already corrupted priests and princes, and that may have even grander, darker plans. Elisha travels to the continent to warn England�s allies of the mancer threat, as well as to discover the full extent of the mancers� plans. But it soon becomes clear that if he is to have any hope of stopping those plans from coming to fruition, he must forge new alliances in unexpected places�as well as embrace the terrifying magical abilities in his possession, a move he fears will make him into just the kind of man he strives against.